Recent reports indicate that DL Mike Daniels could wind up missing the remainder of the season with a foot injury. Cardinals linebacker Josh Bynes left Sunday's contest after just 23 snaps with a thumb injury and was placed on injured reserve shortly thereafter which means he will miss the remainder of the season. DB3+/DB2- Tony Jefferson suffered an ankle injury and ultimately could not finish the game. We should know more about his game status for this week in the coming days. Pro Bowl safety Eric Berry is finally expected to return to the practice field this week. It's unlikely he will suit up for Week 13 but has a good chance to return in Week 14. Given he's been out of action for quite a while, it will likely take him a few weeks to get back to full-time status. This said, he's not likely going to be a useable fantasy option in 2018. Cameron Jordan had struggled over the last month or so as he only had one sack over his last five games. That changed this past Sunday as he garnered two sacks. He has some nice matchups to end the year, so he should be able to finish in that DL1- range that we are use to see him slotting into. In just his second game back from injury, Joey Bosa quickly bounced back to his old form with two sacks on 33 snaps (70%) and is back to an every-week start. Reuben Foster was arrested in Tampa over the weekend on charges of domestic violence. He was released by the 49ers in quick fashion after the news broke (and consequently picked up by Washington and put on the Commissioner's Exempt List). Elijah Lee will see the biggest benefit with Foster's departure, but he still looks to be a part-time player so can't be trusted as much more than an LB4. The Cardinals waived Bene Benwikere this week who had been a viable IDP option for us in recent weeks. DT Robert Nkemdiche (ARI) - Nkemdiche had a fairly strong start to the first quarter of the season, but his play dropped off in subsequent weeks and he missed the last two weeks due to injury. This combination of factors has caused him to fall off the radar in a lot of fantasy leagues. The former first round draft choice came back to life last week with a dominant 2.5 sack performance (4 TFLs) and should be someone you entertain as a starter in DT-required leagues, especially with three fairly good matchups forthcoming. 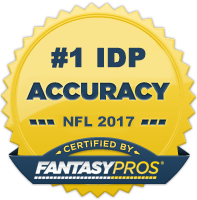 DE Carl Nassib (TB) - Nassib was mentioned as an IDP pickup a few weeks ago, but I wanted to resurface him this week as he continues to be a strong play. He's generated at least a 0.5 sack in four straight weeks and continues to make the most of his new found playing time. Consider him a DL3- moving forward. DE Allen Bailey (KC) - Despite having six sacks on the season, Bailey is still largely unrostered in fantasy leagues. His low tackle production is a contributing factor in this low roster rate, but the emergence of teammate Chris Jones as a near DL1 has also caused Bailey to go largely unnoticed. He's had sacks in consecutive weeks however and has a great matchup this week against the Raiders who give up the second most points to opposing defensive ends. He's a low-end DL3 in 12-team leagues. LB Vontaze Burfict (CIN) - Burfict's been a difficult player to project in recent seasons as he's missed a copious amount of time due to injury and suspension. To that point, he's only played two full games this season and has fallen out of favor with a lot of IDPers this year. Given all the injuries along the Bengals linebacking crew however, Burfict has a good chance to finish the year strong and build upon his 8 tackle average in the games in which he's played near 100% of the snaps. LB Gerald Hodges (ARI) - Hodges took over for an injured Josh Bynes in the first half of last Sunday's game and wound up compiling 10 tackles while playing 67% of the snaps. Hodges, a six-year veteran, has had flashes of fantasy starter potential when given a full complement of snaps in the past so there's good reason to believe he can produce at a LB3- level for the rest of the season with Bynes now on injured reserve. LB Anthony Walker (IND) - Walker has seen his playing time and production waver over the course of the 2018 season; however, he's had 25 tackles (19 assists) over his last three games and saw some of his higher snap count percentages last game. He has three top-10 matchups in the Jaguars, Texans, and Cowboys on the schedule next, so makes for a decent LB3- upside pickup for the home stretch of the fantasy season. S Jordan Whitehead (TB) - Whitehead's production has exploded in the last two weeks (7-1, 10-1) with Kwon Alexander (IR), Lavonte David, and Justin Evans all out due to injury. He'll be a top 25-30 DB play this week if David and Evans remain out. S Ibraheim Campbell (GB) - The Packers have been decimated with injury in their secondary with Kentrell Brice being the latest casualty. Ibraheim Campbell, who was signed just a few weeks ago, replaced Brice in the lineup and racked up 8 tackles on 53 snaps. If Brice were to miss any time, Campbell could serve as a sneaky DB3- play in deeper IDP leagues. S Karl Joseph (OAK) - Joseph, who was considered a potential long-term DB1 option coming into his rookie season, quickly fell out of favor with the new Raiders' coaching staff and disappeared off the fantasy radar. With Oakland's season in the garbage, they've turned back to Joseph as of late and his production has rebounded in recent weeks as a result. He played 87% of the snaps last week and had 8 total tackles (7 solos). So if you are desperate for a DB filler this week in deeper leagues, Joseph is a decent option that brings some upside.